We Install Nearly 1 Million Square Feet of Material Annually in Texas! As the leaders in commercial wall systems and Trespa's only national fabricator in Texas, we've partnered with architects and contractors in the area to redefine quality architecture since 1996. Our composite panel systems offer architects and contractors flexibility, aesthetic appeal and longevity. We manufacture custom wall panels in a variety of finishes, colors and material compositions. NOW Specialties' commercial wall systems meet or exceed the industry's prevailing test standards and design criteria. You Define the Space. We'll Engineer it. With NOW Specialties, not even the sky is the limit. Our work truly makes a statement, whether expanding on existing buildings or completing a new entry or feature wall. The team will bring your vision to life, and stay transparent the whole way through, we guarantee it. Our specialties include complex geometries, large scopes and tight schedules - simply request a bid and we'll show you how. NOW Specialties presents the Cotton Bowl, last renovated in 2012. The Cotton Bowl was originally named Fair Park Stadium, with a seating capacity of 46,000 (although periodic retrofits have doubled that capacity to 92,100). Today, it is the ninth largest football stadium in the United States. 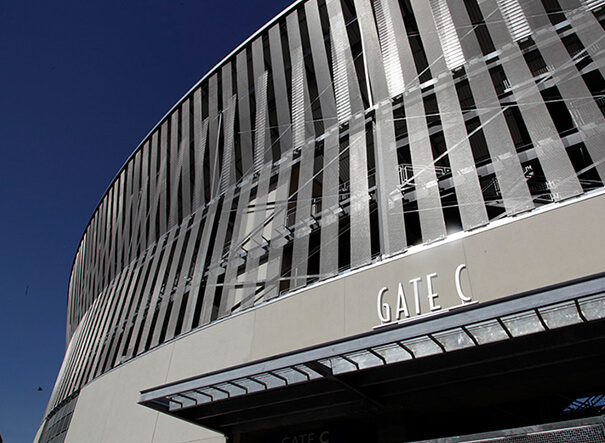 Heery International was responsible for the 2012 renovation, which featured a dramatic stainless steel mesh design and silver metallic accent band. Cambridge Architectural provided two of their architectural mesh patterns, Midbalance and Pellican, as they were tireless in their support of our installation. NOW Specialties is grateful for the opportunity to work with Balfour Beatty Construction, the architect and our amazing suppliers throughout the improvement of this true Dallas icon.